Book Review: Charles Larson, By His Own Hand Upon Papyrus: A New Look at the Joseph Smith Papyri. Institute for Religious Research, 1992, 240 pages, appendix, notes, index, ISBN 0-960963-2-6 (paperback). A translation of some ancient records, that have fallen into our hands from the catacombs of Egypt. The writings of Abraham while he was in Egypt, called the Book of Abraham, written by his own hand upon papyrus. The Joseph Smith papyri, long thought to have been destroyed in a fire in Chicago in the late 19th century, had in reality found their way to the Metropolitan Museum of Art in New York City, where they came to public attention in 1967. Their rediscovery established for certain that Joseph Smith had authentic, ancient Egyptian documents in his possession when he produced the Book of Abraham. Unlike the gold plates of the Book of Mormon, which scholars were never able to examine, these Egyptian texts give the actual documents from which Joseph Smith claimed to have produced one of the LDS church's scriptures. Therefore, they provide the first real opportunity to examine the prophet's claims in an objective and scientific manner. In the first two chapters of By His Own Hand Upon Papyrus, former Mormon and Brigham Young University graduate Charles M. Larson, recounts the circumstances under which Joseph Smith acquired the two Egyptian scrolls, and his claim to have identified one of them as an account by the Biblical patriarch Abraham of his sojourn in Egypt (as described in Genesis 12:10-20). Then in chapters 3-10 Larson steps the reader through a detailed array of primary physical evidences which establish four major points: (1) the papyri which came to public attention in 1967 (color photographs of which are reproduced in the book) are indisputably those which Joseph had in his possession when he produced the Book of Abraham, (2) Joseph Smith did purport that the Book of Abraham was a translation from one of these papyrus scrolls, (3) the scrolls are now known to date from around the time of Christ, some 2,000 years after the time of Abraham, and (4) the scrolls have been identified by Egyptologists — including LDS scholars — as common, pagan Egyptian burial documents, that do not mention Abraham and have no connection to the contents of the Book of Abraham in the Pearl of Great Price. In my opinion, it's the best source to go to if you want to know what's been going on with the Book of Abraham in [the] church. I mean, he has a pretty good summary of all the types of approaches that have been made. He does a pretty good job of explaining what they are, what the papyri are. He's [got] great pictures of the papyri. That's the nicest thing; you can really - really neat photos [sic] of the papyri themselves. And people worry about the accuracy, is this book accurate or not? Well I'll tell you, he's far more accurate than anything Hugh Nibley ever wrote on the subject, okay. So if you're willing to read Nibley, you can read this guy and not worry about it. I mean, because Nibley is far, far more free with his treatment of primary and secondary sources than this guy ever would be .... Nothing that's been written from an apologetic point of view comes close to it in accuracy. 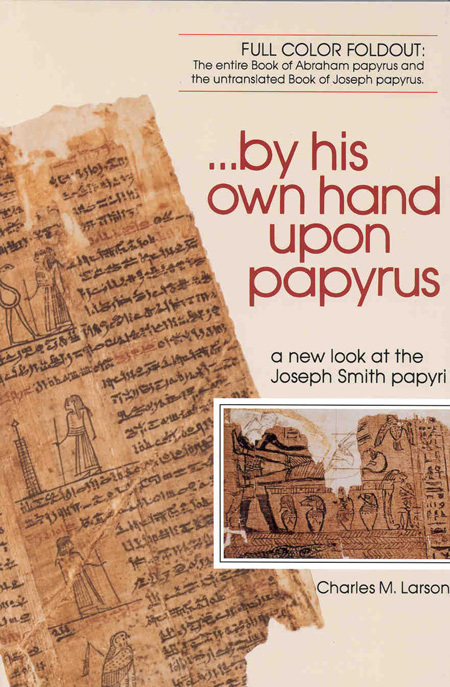 By His Own Hand Upon Papyrus includes an impressive foldout panel with the first published full-color photographs of the Joseph Smith papyri. It also includes photographs of Joseph Smith's original translation manuscripts for the Book of Abraham, and translations by modern Egyptologists of the Egyptian text of the Joseph Smith papyri. Later chapters of the book provide an up-to-the-minute examination of the various theories which Mormon scholars have put forth to defend the integrity of the Book of Abraham.